Welcome Encouragement for Today friends! I am so glad you are here! In my devotion today I shared one of the many ways I have learned to process my worries and fear, and how God used my own struggles to help my son overcome his. And I also wanted to share a printable to download and keep for those days when you and your loved ones feel afraid. 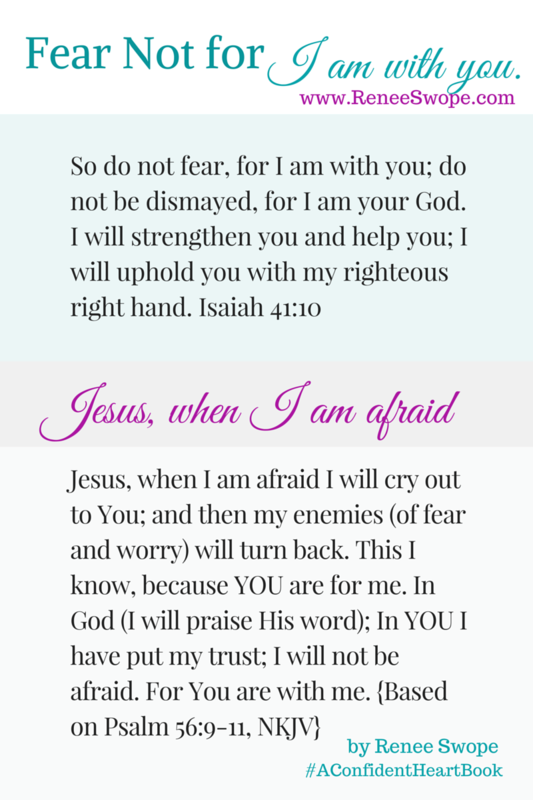 CLICK HERE to download my “Fear Not For I am With You” FREE printable. These verses have been woven into countless conversations I’ve had with Jesus about my fears and worries, and my kids’ too. I love these scriptures because the first one includes God’s words speaking to me, and the second one is phrased as my declaration and prayer back to Him. There is nothing more powerful than our hearts hearing our lips proclaim our trust in God’s truth. Again and again. I pray this printable is a blessing today as you let it lead your anxious thoughts to Jesus!! Hold those worries in your hands and ask: Is this what Jesus would say to me? If fear is saying something to your heart that Jesus would not say to you – then the answer is NO! And YOU GET TO DECDE that it doesn’t get to stay! I’m praying for each of you who stop by today! Enter to win my A Confident Heart Devotional book and my favorite prayer journal from DaySpring. Perfect for summer and life on the go – my Confident Heart Devotional book is filled with powerful stories, practical life-lessons and biblical insights to help you and your loved ones overcome fear and worry through the power of God’s truth each day! How much does fear or worry impact your daily decisions and joy (or your child’s)? Click “Share Your Thoughts” below and do just that. Your comment will be your entry to win! Do You Ever Wonder How “She” Does It All? Ditto to the comment above. However, fear is no fun and my favorite encouragement is: “What time I am afraid, I will trust in You!” Ps. 56:3. Another encouragement is: “Do it afraid!” Still another: “Fear not for I am with You….I will help you! Is. 41:10. Yes something went wrong. I got nothing showing also. I have learned more about trusting God in the last few months than in years. BUT none of it has been easy. I was looking and looking for the 5 truths and I didnt see them. But I do have to say that When I am afraid I lift my eyes to hills from whence cometh my help. My help comes from the Lord who made heaven and earth. So since God is the maker and giver of all things then I have nothing to fear. The Lord is always with me. Yep, only comments he re, nothing else but the title. Could not find the five exhortations, but found the comments outstanding and encouraging. Thanks guys! Blank for me too. Just title and link to here. No article on mine either, but……God tells us not to fear 365 times in the bible….enough for every day of the year!!! I am having the same problem as those above. I do know that I could not make it without Christ in my life and wonderful devotional books!! Hold tight, I know Renee will fix it and send it back out. Can’t wait to see it! Would love to be able to read this when it is fixed!! I didn’t get anything either. Please let us know when it is fixed. Love Renee Swope and her ministry. So I’ll send you the missing post in the morning. Thanks for fixing this, Renee. It gave us a good chance to Trust In God! Good things come to those who wait! It is wonderful! Blessings to all. It still isn’t working, when you click to download it only opens up an Internet page that has two verses on it. My 9yr old is in therapy for anxiety and this article is a great tool for me…thank you! Hurry up and wake up Renee! haha!!! I still can’t see the article? But I need it! Looking forward to the article, too! Thank you in advance! Oh my goodness, were you in our house last night? My six year old and I had a similar conversation. I’m trying to equip him with tools to help ease his fears, verses, and prayers. Thank you for this, not only do I know I’m not alone the baseball analogy will be shared at the breakfast table. Thank you! *smiling* great conversation! And I too was looking and looking, but didn’t give up! Hope you slept well! I had a day of Anxious Thoughts and realized I too had them ever since I can remember! This was perfect for me to see, and I look forward to getting the info! I thought I was going to print a lesson, I jpt this note instead. I am getting a blank screen only title. This is a struggle I have and want to help equip my daughters with the knowledge to always seek God during those times. Amen! Waiting for the update with the info as well. God is so good and as a sister who took in my youngest sister when she was just 7 and myself 17. I wish I’d have known to tell her this to comfort her. She worried so much it drove me crazy at times. I wished so bad she’d have peace, when all along I should’ve prayed for peace. Today I will share this with her. Thank you Renee! I am trying to identify my fears, and recognize them, so I can throw them out, before they take root. The Holy Spirit is definitely helping! God is faithful in ALL ways! Hoping the printables will be available. What a great thing to put on my bathroom mirror to remind me first thing! Satan can do so much before I even begin my morning devotions! Leslie, let me encourage you. When you seek help for your daughter you are helping her. I know exactly how you feel. My husband and I went through a time with our son and we had to seek outside help. It hurt to realize I couldn’t be the one to help him work through the situation but God provided exactly the right person who could help him. This is not a reflection on you. Blessings on you and your daughter. Worrying and anxious thoughts have been such an awful part of my life lately. I need to remember to throw those back into the outfield! What a great treasure to find this morning! My daughter has been struggling with fear – she is 8 yrs old. I have been looking for scripture to equip her so when we pray at night she she is “armed” with reminder’s God’s promises. We have found some but today’s verse really resonated what we are trying to do with fear and worry. Thank you so much for sharing your story and AND the printables! Renee, you are a blessing! Nothing showed up but I saw your response. “In all things give praise to the Maker of all things.”…looking forward to the printable! Thank you for your written ministry from a fellow writer! I have struggled with anxieties my entire life and unfortunately I have passed that on to my oldest daughter who is now 8. It hurts me so much to see her little face full of anxiety and her stomach in knots. I too just want to take it all away. We have been focusing on learning short verses lately that she can repeat over and over during her times of fear and for her to lean on Him to take the fear away. Dont worry about anything. Instead pray about everything. Phil 4 6-7. Can’t wait for the article and printable! It’s 7am on the 30th and still nothing. The early birds are not “getting the worms” today. The article was in my email, but the blog doesn’t seem to have caught up yet. I’ll check back later because the printable sounds like a great thing to have handy. Our sin is a worrier – worries about similar things as yours did in this devotion AND he’s a baseball player so I can’t wait to teach him this trick! PS we just checked out your kids book on worry from the library that we’re going to read together! Blessings to you and your family! This past Dec my daughter’s father shot and killed himself; after calling the girls to say good bye. I even talked to him and tried to get him to change his mind. When he hung up the phone he pulled the trigger. I took my older daughter (17 years old) to go see him, she wanted to talk to him face to face. The drive is about 45 minutes. We were not sure if he really had done it yet or not. The 15 year old said she needed to stay home to study. After driving about half way to their dad’s house their half brother called the 17 year old and told us to stay home. Now both my girls have been struggling with fears and anxiety that I can’t help them with. But after reading this I maybe able to help them more. I am forwarding the email to them. Great advice and key verse! Wow, it’s very eye opening to read all the comments about young ones with anxiety. My son is 5 and has started to worry about things recently. We must cast out those thoughts from Satan!! 1 Thes 5:16-18 Pray continually! Oh friends, I am SO SORRY. I woke up at 6:30am to load this and my site is still locked down. PLEASE PRAY with me that I can get my password reset. I am waiting for a link to be sent to my email and it hasn’t come, even though I requested it 30 minutes ago. PLEASE SUBSCRIBE to EMAIL UPDATES in my sidebar so you will receive the post when it goes live today. And if you don’t want to stay on the email list, you can easily unsubscribe once you get today’s update. Thanks, Renee and my prayers are with you! My daughter is going through fear right now, especially with sleeping! This was God’s timing. I can’t wait to print these verses and your printable! Thank you for your devotion. Yes! I read your emails too! It’s been great being with all of you through the comments. Looking forward to the update Renee! It’s 4:00 in AZ & still no article because it is way too early! I look forward to seeing your printable as since yesterday it was not there. I struggle with crippling social anxiety & it breaks my heart to see my youngest daughter struggle too. My other daughter struggles with fear too & insecurity but is much more confident socially. I look forward to seeing your printable as since yesterday it was not there. I love how you used the analogy of catching the anxious thoughts & tossing them like a baseball.i look forward to your other words of wisdom. My 12 year old son deals with a lot of worry and anxiety because he has a hard time fitting in socially with kids his age. He doesn’t make friends easy and that really bothers him because his younger brother can make friends with anyone. I was very encouraged by this devotional today and can’t wait to share it with him! Thanks Renee!!!! Thank you for a simple visual nod action plan that is good for worrying adults, too! That is the most simple way to explain how to capture those thoughts. I had always wondered how to do it, it helps a lot. Thanks for sharing. Great read for any age. Just what I needed to hear this morning! Thank you and I loved the baseball illustration! I appreciate your message. I have a tendency to worry and I always have to remind myself that God is in control of everything. He is so good to me! I can’t see where to find the download or the tips. Please help. **As noted above Renee is having technical issues. PLEASE PRAY FOR HER!!!! If you are not subscribed to her blog updates, be sure to SUBSCRIBE TO EMAIL UPDATES in her sidebar and you will receive an email when the post is updated. (you can always unsubscribe after). No downloads or comments. Fear is what’s a struggle for me. Fear consumes and snuffs out the light which God created in me. I am going to use this wonderful tool and analogy for myself and my young son. Thank you Renee for your relationship with God that gave you words to share. Excellent reminder of how to speak truth to my grandsons heart! Patience. God is with all of us. Thank you Renee for the awesome visual!! I have struggled with fear and depression since I was a child. I was diagnosed with bipolar at 15 and even though I’ve been stable since then for the most part my worry and anxiety can be overwhelming sometimes. I always figured that “it’s just the way I am, I can’t change it I can just learn to live with it.” I have prayed into my fears, I have done Bible studies and shared with Christian friends who can pray with me and for me. But still I struggle big time with fear, it cripples me. This visual though!! I’m going to try it today 🙂 thanks again!! So many have mentioned their children and fears. As I sit this morning reading and listening to the rain and the thunder outside, I am reminded of when I was a scared first grader myself during a thunderstorm. I am now 43 years old and I still remember the day like it was yesterday. My teacher comforted me with the verse Psalm 56:3, “What time I am afraid, I will trust in thee,” and I’ve referred back to that SO many times in life. She has gone on to be with the Lord, but I will always love her for the example she set before me. I am living proof that the TRUTHS that we teach our children “will not return unto us void.” We may think they are not listening, but our words (positive and negative…so I have to remember to choose wisely) are often imprints left on their hearts forever. Thank you Renee! Dealing with this right now with my 7 yr old right- his curiousity about tornadoes and fires are turning into anxiety. I will use your suggestions! Thank you! I wish I’d read this devotional last night when it came in after midnight! Yup, I was awake! Worrying about 2 of my grown kids and my granddaughter who’d left for her 1st time to church camp! My night was long and restless! But I loved reading it this morning and I could visualize this. ..picking up rocks from the beach and throwing my worries into the depth of the ocean! My three year old daughter inherited worry from me. In a sermon years ago a pastor said to throw ungodly thoughts like a baseball. I needed this reminder today as I am heavy laden. Thanks, Renee. My youngest son struggle with fear and hearing voices, I would repeat that scripture to him often and let him know that at what time he is afraid to trust God. He is now 29 and he will still call me when things trouble him and I point him to Jesus. I will also tell him to pray and trust God because if you are worried that is not trusting. Whisper a prayer and lean on him in every situation and every circumstance. Thank you for the reminder. I serve an awesome God. I never knew there were 365 times where God spoke about the topic of being anxious. He always provides. Thank you Renee for your encouraging words and the ministry God is leading you in to share with others. I think, even as a little girl, I always knew to trust God. I didn’t always do that and “Oh Boy” what a miss I made of things. Now that I am older, “much older”, I realize I never had the answers and he always did. Thank You God for never giving up on me. Thank you group for helping me grow on this never-ending journey. Today I am turning these fears over to God and accepting the peace and joy that He wants to give! Praying for you and your family, Marisa. God’s love is washing over your fears, in Jesus’ name. His perfect love casts out fear. (I too, need to be reminded of this, I am having fear/anxiety too). Continue to pray for Renee’s technical issues. If you are not subscribed to her blog updates, be sure to SUBSCRIBE TO EMAIL UPDATES in her sidebar and you will receive an email when the post is updated. (you can always unsubscribe after). Can’t wait to see the post! I, too, received an empty email (nothing but title and link) and clicked the link and see an empty page. A topic that all of us can relate to! I have struggled with anxiety and worry for many years now. I am trying to overcome and I love the thought of thinking of the worry thoughts as baseballs to be thrown away. Thank you. I am a single mom trying to encourage and raise a little girl about fear and not to worry. I would love to have the tools and scriptures to help her and understand and give her the tools about fear and worry. Thank you for your devotional today. I love the physical act of throwing the worries away like a baseball. So often we feel like we need to do something more and throwing the worry away satisfies that need. I will be teaching my children to ask themselves “Would Jesus say that?” . I am a big worrier I believe in god and I know he will get me through but I cant help but worry over money my kids my life everything. I need the book to help me get stronger in Christ. prayers. Hi, Renee: Thank you so much for sharing this. I should have read it yesterday. 🙂 I had an incident Friday that I thought I pretty much dealt with, then yesterday, I started thinking about it again and started to wonder and now I am nervous again. 🙁 I won’t go into details, but the worry and anxiety are doing absolutely no good. I will remember God’s promise and cry out to Him. God continue to bless you richly! My daughter gave up going to a Christian camp over the fear that she might do something that would be embarrassing and certain kids would judge her for those actions. It breaks my heart that she is so paralyzed with fear to miss out on special times of being with friends because anxiety is controlling her heart. I look forward to sharing all these tools with her so we can start to beat back that worry that the devil has placed on her. Thanks for being willing to share your amazing thoughts and words. I love the physical act of throwing your worries back “into the outfield.” My eating disorder has started rearing its ugly head again and I am worried about fixing it. I have never read 2 Cor 10:5 in the context you put in today, Renee. Thank you so much for the devotional!!! Jesus would tell me that I am in control with His help. Have a blessed day! Fear and anxiousness are a pair that I need to keep in check daily. Although not a happy marriage by any means, last fall my extraordinarily healthy tennis playing husband was diagnosed with a rare autoimmune disease that caused him to suffer over 20 mini-strokes. Over the following months, he became the poster child for recovery and was doing great. Then in May, he suffered a larger stroke which has completely debilitated his left side (arm and leg). No longer able to care for himself, I have become his caregiver. Plus mom to our two girls and working a full time job. This is all in the midst of selling our home and now trying to secure a rental home that is accessible. Yes, fear and anxiousness try to sit on each shoulder taunting me into despair. But my faith in Jesus is stronger and whenever these evil pair strike, I turn to prayer. I know we will make it through this. It won’t be easy and I know that it will get harder before it gets easier and we may never know God’s plan through this all, but we have already witnessed so many blessings from this tragedy. We thank the Lord for each blessing and reminder of his divine love and forgiveness. I feel like I constantly worry..especially about my children…so much so that it gets downright depressing. I need to rely more on God and less on worry. I am so sad and so ashamed that I have passed that legacy of fear and worry on to my children and grandchildren. Growing up in a house that was more like a war zone, I struggle daily with anxiety and worry. The unpredictability of adult life resonates back to the unpredictability of my childhood. I recently decided enough was enough and have laid this burden before Him. I have verses plastered all over my mirror about trusting God instead of living with fear. I immerse myself in these verses every morning and every evening before bed. He speaks to me and my heart is healing. Fear and anxiety have ruled me my entire life. It is only recently that I see that the majority of people don’t live this way. I’ve been working hard the past 8 months to overcome this stronghold on my life, but there is a ways to go. I believe in God but have the terrible habit of giving things over to him and then taking them right back. Satan has a field day with me and my worry! Taking every though captive is definitely a discipline that I am trying to work on and having this devotional to really dive into every morning would be an even greater help! Thanks for the printable. Isa 41:10 has long been one of my personal cornerstones. Fear impacts me a lot & i believe my son also. I take anti-anxiety meds& they help, but I need to trust that God will help even more. My son is 15 & worries a lot. Since 15 yo boys are always right (LOL), there’s not a lot I can do for his issues besides talk to him about it. I also tell him to pray & he says he still does that too. Just this morning I was crying on my way to work after dropping my boys off. I was so worried. I worry about every little thing & don’t enjoy my kids being kids. I cried out to God as I cried & drove. Worry/Anxiety is a huge tool for Satan to use on me, and I have to go to God every time Satan tries to bring me down. My sons also worry more than they should, and I know I need to take their attention to God instead of just saying it’ll be ok & telling them not to worry. For most of my life fear was my daily companion. My father would drink and then become very mean to my mother and us kids. Then I married the same type of man and was married to him for 3 years. About two years later I married a man who was the complete opposite but after 21 years of marriage he decided he didn’t want to be married anymore. I was devastated, lost and alone except for my son who was in his first year of college. But through this storm in my life, the LORD found me and saved me. I have not been alone and afraid since then. But the LORD had even greater plans for me. After 9 years of living alone, HE brought a wonderful Christian man into my life. We have been married two years now and my husband treats me like a queen and he loves me so much and I love him so much. The LORD is so good! I struggle with my thoughts and worries. I am daily working on turning it all over to Him. These resources would be a tremendous help for me and our Women’s Refuge Group that God has me currently facilitating. God has us doing Dr. Henry Cloud’s “Changes That Heal” and I don’t know where He is leading us next, but I know he wants us to allow Him to Heal us and Change us so we can become the Mighty Women of God He has designed us to Be. Loved reading this devotional! My daughter is 8 right now and although she doesn’t voice her anxiety too often, it is clearly an ever present issue for her. She is timid to do many things out of fear that it won’t be what others are looking for. She is definitely a people pleaser and we talk often about how while we do need to consider others feelings/reactions, ultimately as long as we are pleasing God that IS what matters. I have printed off the free printable, so thank you. We will frame it together in her room. Winning the book on top of the free printable would just be frosting on the cake. Thank you for all your supporting and motivating words and devotions. Blessings! My boyfriend and I broke up 2 years ago and he moved out due to his alcoholism. We have remained close and he just recently he came to his breaking point and its been over 6 weeks now he has been sober. I prayed for years for him but it had to be his timing not mine and everything is going good. I am remaining positive and not waiting for the shoe to drop or for him to fall off the wagon. He really has had his spiritual awakening I feel and I have no control over what he may or may not do. I can only trust God and believe in him and encourage him. He has started running with me as well and trying to be healthy physically and mentally. Its a great time for him! Thank God 🙂 All I can do is Let go, Let God! Fear normally takes up residence in my thoughts at least 25% of the time each day. The truth is that unfortunately I have become consumed with worry and fear to the point that t regretfully feel paralyzed. My heart then feels guilt because God has ALWAYS been abundantly faithful to me and blessed my family and I with so many miracles that I struggle to have faith that He will continue to guide me through whatever comes next. I feel as though I am continually failing my husband, boys, and the rest of our family once known to be a strong, prayer warrior of God, now to be recognized has a fearful woman that can’t make a decision or be out on her own. I would love to be free from this anxiety and fear. I have to say that for me, I remind myself that worry and fear are NOT of the Lord and just a way for the enemy to attack me! When I feel myself go down that route, I am QUICKLY reminded that this isn’t the Lord and I will NOT think this way and REJOICE that God wants me to have PEACE and a SOUND MIND……all I do is give it ALL to Him and I no longer FEAR or WORRY! HE HAS IT ALL!!!!! It has been a lifelong struggle to overcome fear and anxiety. I’m thankful for the work that Renee has done to remind us of His love and faithfulness. Abandonment has been a huge factor in my life as well. I’ve tried to stay in control and haven’t truly learned how to form healthy relationships. Still learning to trust God because the earthly relationships haven’t lasted or have left scars. I am seeking myself in Christ right now and praying/asking for prayers regarding my marriage nonstop. I’ve realized I can only be responsible for myself and leave my husband to God. I do want to give a great big “HALLELUJAH” to the Lord for bringing my son our of his depression and fears. I was able to encourage him with the Word but am struggling to accept it myself. I will be looking for this book regardless. Thank you. I spend my days plagued by fear, worry, anxiety and emotional highs and lows. It’s something Christ and I have been working on for quite some time. I’ve come through some really deep and dark places…I’ve been a cutter for several years, thought of suicide and barely been able to get out of bed. I have been at Christ’s feet begging and pleading and hoping and praying…and He always brings me through, and it’s always challenging, but I know that He is good. I’ve never been much of a worrier, although my mother was and my sister tends to be. But I have some major life affecting decisions to make in the next several months and it’s easy to slip into being anxious: Am I making the right choice? What if…? How do I know which choice is God’s will? These things can make me nuts. Renee, thank you for the fresh reminder that God is not the author of our anxious thoughts. This devotional is a right-on-time message. I’ve been dealing with worry that has been stealing my joy and affecting my motherhood. I have to learn how catch every thought, analyze it, and determine if this is something the Lord wants me to meditate on. If not, toss it away and focus on Him and His goodness. I don’t want my son to have my habit of worry. I want to be able to teach him how to fight away worry. If I was able to get much from the devotional for myself, then this book would help me teach my son what to do. Worry and Fear have impacted my daily decisions as long as I can remember. These past few months I have felt stuck: stuck in a mundane job, stuck in debt, stuck living with my parents, stuck with a hoopty car, etc., etc., etc. No matter how often I prayed to God to pull me out of this rut, it seemed like I was talking to a wall. He wasn’t there, and He wasn’t listening. I was going to church, involved in a small group, staying in my mundane job because it was the “responsible” thing to do, and no matter what, “I should be working with my whole heart as though it is for the Lord.” However, this morning was different. I woke up, and started my morning (as I had previously) reading through the Book of Proverbs. As I was reading, I felt this tug at my heart to just pray. So I did – I confessed to Jesus my sins that I had been holding onto, the anger I had towards my family, the anger at myself for not moving forward in life, and ultimately I just needed Him! I gave Him all of my fears, and anxiety, and worry, and asked to receive Him as a little girl who needs to be corrected by her Father. It felt so peaceful! In casting off my worries (though they still creep up behind me) I know that I need to quit my job. That He will help me forgive, and release the anger I have towards my family. That I need to trust in God to walk next to me, and in front of me, as He guides me down His path. He will not let me fall. He will send me through some storms, but He will not let me fall. I worry too much! I worry about everything under the sun.. even though I know it doesn’t fix a thing! As a single mom, there are many many concerns that I deal with everyday! I have to learn to address them as I can instead of letting them consume my thoughts. I also do not want to pass this along to my children. It affects my life every day and has for as long as I can remember. Some days are worse than others. The Lord has really worked a miracle in me to deliver me from fear in many ways, however it does still always try to find a way in. There are definitely times it comes to call and finds cracks to start getting into my thinking. I really have to be mindful of what I am thinking, what I am telling myself. It is a constant battle in my mind to overcome those thoughts of fear and doubt and to be the woman I know God created me to be. Confident, courageous, and strong! This was a beautifully written reminder of what I need to do not only for my son who worries a lot but for me also. Thank you for allowing God to use you to speak to me today. Fear, worry, and anxiety have been my constant companion throughout the month of June as I have faced a plethora of trials from the enemy. It is easy to have joy when things are going well, but the true test of our faith comes in having joy when things are not going our way. The enemy comes to, “steal, kill, and destroy.” This month, God has been testing my faith and trust in Him for just about every aspect of my life: finances, health, transportation, groceries, basic needs. These books would be a welcome resource as I continue to battle fear, worry, and anxiety and live the abundant life that Jesus died for us to live. I am struggling with the loss of my life companion. He passed away 2 months ago, now I am afraid of loosing my home too. I pray everyday for answers, for God to lead me in making the right decisions. Awesome devotional! really blessed me. My family is heading to a big change and the devil has instilled much fear with the outcome, but The devil is a Liar!! And your devotional is just what I needed to be reminded that Fear is faith in the wrong place. My trust is in the Lord. Definitely , I live my life with worry and fear . The past 3 months had been very trying with every area of my life placed at the crossroad! Fear gripped me & I fight to overcome negative thinking & despair. The verse Isaiah 41:10 is what I held on to . I also tell myself God did not give me a spirit of fear, but of power and of a sound mind! Thank you , Renee for being transparent & honest in sharing your challenges and struggles with other women aiming to encourage , empower and pointing to the power of Jesus to transform our minds and lives through His living Words. This article is so timely as I tend to worry about my life and the way I use my time. When I am worried or fearful, I will ask the Lord to take that worry and throw it away…just like the imaginary ball you illustrated with your son. I also know that after casting this worry or fear away, I need to pray and ask the Lord for peace in all my situations and rest in His love and grace. This is encouragement I needed to hear when my daughter was young but I am hearing it in God’s time not mine, so it is not too late. Thank you for reminding me to lean on His strength! I am a mother of twin 7year old boys and a 4year old girl. I am married to a wonderful man who is a youth pastor. So along with my own three children, we minister to 40-50 teenagers every week. I try to always be refilling myself so that I can pour out effectively! I would love to have a copy of your book to do just that. I receive the proverbs 31 devotions sent through my email and they are treasured. Thank you for your ministry and willingness to be poured out for the Lord! Blessings! Fear and worry have dominated my life since I was a young girl. I so long to be free of these things hindering my walk with Jesus. Daily I cast my cares on Him but I’m not good at leaving them there. Jesus is the same yesterday, today and forever! Along the ups and downs of life I need to focus on HIs Word and give him any worries. It isn’t always easy or my first inclination, but He is waiting for me to trust in Him with everything, ALL THE TIME. How I thank Him for His mercy and grace! So- He knows that worry and fear cling to this flesh BUT- He has provided the way to have victory and Joy in the midst of it! Your devotions have made such a difference in my walk with The Lord. As I walked through breast cancer I grew angry at God for letting this happen to me. But now as I walk in faith, why not me? Right now I am focusing on telling God that I trust him, even through the unknown. I am trying to release things to him every day. One of these “worries” is my 10-year old son who tried to kill himself recently. We are on a journey with him to get into his world and see what is bothering him and why. Another “worry” is the fact that I have to quit my full-time job to student teach in August and I still do not have another job to take its place. This is definitely a journey for us in our family and we are working on remembering Christ’s truths to us and place our lives in His hands on a daily basis. It’s a process, but I am confident that Christ is going to lead us through. “How much does fear or worry impact your daily decisions and joy?” – When I’m in my comfort zone, I feel peaceful, yet throughout my life the Lord continues to take me out of my comfort zone, which causes me so much fear. I have struggled with panic attacks because of it (on and off), shortness of breath, back pain, and more. As a child, I often dreaded the classroom at school for fear of being called on. When I got called on my face would turn red, my voice was all shaky, I would sweat. My stress of my parents divorce was hard on my health, I had to go to the nurses office a lot from symptoms of extreme anxiety~ dizzy, vision caving in, breathing into a paper bag because of hyperventilating. I got through school and college somehow even though I was a nervous wreck often, and even skipped a day when I had to give a speech with a group. As an adult one of my biggest fears was my wedding day, because people would be looking at me. God did a miracle though. Even though I had a panic attack at both my bridal showers, there were so many friends praying for me (people who knew my severe struggle with anxiety), and on my wedding day I had peace. I’m so thankful for memories of how God has come through. Once again the Lord is taking me to a place where my fear of people looking at me (that I’ve had since I was little) is bombarding my mind. Yet I believe the Lord wants to REALLY heal me of this. Even more than I know. I’ve been having shortness of breath in the last month or two (thinking about God’s plans for my future) and God is comforting me through it. I really need to learn to replace these dreadful thoughts with good thoughts. His plans for me are so good, but because of my fear (lies), it’s so scary for me. Thanks for these words today – helping me remember to stand on God’s truth & competence as God in the mist of circumstances that “scream” otherwise. Fear and worry have had a huge impact in my life ever since I can remember. It was learned behavior from our mother. Bless her heart, we lived with an alcoholic father. We never knew what mood he would be coming home in. We were all fearful that if he came home drunk no telling what was going to happen. Even though I have been a Christian for many years I still struggle with it. I have to bind it the name of Jesus. Nothing is too small for him. I praise God that we have him to turn to and the promise of eternal life. I thank you for encouraging us and keeping us learning the truth that builds that faith . Worry and fear effect my joy way more than I care to even admit. While it has gotten better, I still have a long way to go. Thanks for the encouraging scripture verses! Needed so much these days. I like how you used the baseball description for your son. I have two little boys and so I hope to be able to use this idea as they get older. I am a worry wart! I have struggled to not let worry consume me, until I learned to let God have control, does that mean I never worry no, but it does not consume me! Thank you for this reminder. Fear and worry seem to dominate my thoughts. I am so thankful that I can gave an open and honest dialogue with God about how I am feeling. I can also.trust that He will take care of my fears. I think this book would help me deal with life’s daily stuff. I was abused as a child and do not approach things with a confident heart. Any help you can give me would be greatly appreciated! I struggle SO much with worrying! Every day is a constant battle for me. But I realize a lot of the things I get anxious about tend to never happen (since I imagine worse case scenarios) or they are things that I don’t have control over anyways. So I am learning to take every thought captive and to trust God…some days that’s easier said than done, but I’m a worrier-work-in-progress. 🙂 Thank you for your encouraging words in your devotional. I’m a visual person, so the baseball illustration is helpful for me too! 🙂 God bless you and your ministry! As I navigate through some difficult times fear and worry have been there. But, I have made a point to address these when they creep up and pray for strength. I do the same with my 12 year old son. I hope to teach him to rely on God and Jesus, because they are always present. I am almost constantly worried about finances. I am a single mom with 9 and 22 year old children still at home. My husband committed suicide in Dec. 2007 and finances have been a struggle ever since. God has never failed to provide for me, but that is a weapon Satan constantly uses on me–throwing curve balls every now and again to throw me off my game. My worries still rub off on my children and I hate that. I will definitely use the encouragement I’ve received today through your devotion and free printable. Thank you! Thank you so much for that wonderful idea of catching any fears and deciding if God would say that then tossing it if no; this will forever stick with me and be a wonderful tool to help overcome fear and worries. I am always worried about any choice or decision I make in life wondering if everyone else will like it. The only person who matters is God; does he like my choices. Thanks for your inspiration. I was away for the weekend, but concerns from home were on my mind. Not so much specific worries, but just a gnawing feeling of anxiety around the issues, which kept coming back. We passed a church that had a big billboard, which declared “God may ask you to wait, but he never asks you to worry”. What a helpful thought! And Renee’s devotion today was helpful, too. “Taking thoughts captive” becomes much more concrete when we think of catching them like a baseball! I worry almost everyday. When I do, I will pray about it and give it to God. I let it go; most of the time. At times, it starts at small and then overtakes my thoughts. I become negative. When I talk to God about it, my day gets better. I’ll try Renee’s suggestion. God is helping me to kick this sinful habit. God is the answer to everything. I’m so thankful to be his child! Fear and worry, just have always been something that dulls or blunt my ‘razor’, my ability to live life fully in the confidence that I have God’s pleasure, and that nothing unbearably horrible will happen, and that I can and will make good decisions that please God. Worry has done much to rob me in my life. It has robbed me of much joy…. even to the lessening of physical characteristics of joy…. and people tell me that my smile is the most beautiful thing God has given me ! What an encouraging article and reminder to hold fast to scripture promises. I trust Jesus but worry still creeps in. I remind myself that this too shall pass and my life is in His hands. I will carry this with me as a reminder for me everywhere I go. I thank God for His faithfulness. Thank you for your timely words. It’s so easy for me to go down the rabbit hole of fears, worries, anxieties, and doubts. Remembering God’s Word and promises helps me be lifted above the circumstances to His peace. Worry & Fear sometimes grips my heart at work when I am preparing to ask something minimal from my Manager or when he calls me into his office. I guess this is so because of our very first meeting when I began reporting to him. He called me into his office and directed me to not be writing or saying “I am busy” He said, “we are all busy”. It’s too lengthy to go into what my words meant; however, that first meeting has had an impact on every meeting I have with him. crankiness. If I can throw my worries to the outfield, my day will be less stressful and I will be more at peace as Jesus promised in John 16:33. Hi, Shirley: Very good observation about worries stealing joy how they affect us externally as well as inwardly. Thank you for sharing. God continue to bless you richly! Just today I let fear win. We live in a safe, well, so far, safe community. My 12 year old son wanted to go down the road to his favorite fishing spot. I said no, not by yourself. Due to fear and a lot of what if’s. My husband lets him go by himself and says we can’t let fear control us. I think I am being wise to not let him go by himself. But really? I don’t know. Underneath I think it is fear of what could happen. They impact me every time in my decisions! I overcome fears with God’s help!! Thanks for sharing and hosting!! I have battled worry and fear all of my life. It is a struggle I face everyday. I continually read and study God’s word, and any other Christian resource I can find, on the subjects of fear and worry. I need constant reminders in my battle to overcome the wanderings of my mind. Some days I am successful, other days a failure. Either way, I am thankful I serve a God who has overcome the world! I would love to win a copy of this devotional and journal! God is speaking to me about this area of my life and it’s amazing how He always provides! Thank you for sharing your gift! Great article on ” you get to decide” what to do with fear and worry. I work as a child therapist and this article very helpful for children and adults alike. Really important for us to distinguish when fears are there to protect us versus a ploy from the enemy to derail us! If we can sit with the uncomfortable feeling, like holding the ball in our hands for a bit, before deciding how to respond, we can chose to align our reponses with God’s word and receive greater peace even in uncomfortable situations. God is bigger than all fear and worry- Amen! Thank you Tania for your insight. I appreciate your input as a child therapist. I think this is why I don’t like to sit still and feel. Thank you so much for your insights and encouragement Tania. I so agree that some fears are real and need to be unpacked and addressed. But then there are those that are straight from the enemy to derail us and literally steal the life out of our days. I am so very grateful for the Holy Spirit’s counsel and Christ-centered counseling books that has taught me how to work through knowing the difference. And I so appreciate professional like you who do what you do. Thank you so much!! Thank you, Tania for sharing this insight. I am in a place right now where I am nervous about a foolish thing I did and not knowing if I caused damage to another vehicle. I really didn’t think I did when it first happened. Now, for some reason, I am wondering and nervous about it. I tend to get myself worked about things at times. Praise God things like this don’t happen very often. God continue to bless you richly! Thank you for sharing this personal story with your son. I grew up in a home where emotions/feelings were not discussed. Problems were not solved. Everything was swept under the mat and my parents drank to cope with issues. Today as an adult, a recovering alcoholic, a Mom and a Wife, I feel uneasy/anxious when I get a negative thought. I think Satan knows how to work me over in my mind, plaguing me with thoughts of divorce or other thoughts that are not Godly. I truly struggle with taking every thought captive and ask the Lord and Holy Spirit to invade my head/mind daily. My son was just diagnosed with autism and I think that explains a lot as to why I perseverate on thoughts — I have it too. Thank you for your transparency on these real life issues and thank you for sharing. I am a constant worrier about everything. I have a 14 yr old step daughter that is a worrier as well. This devotion truly helped me with the reminder that we don’t have to worry. If we take all or cares humbly before God, He will supply our peace. I really liked the ball throwing illustration that you gave, I will share this with my daughter. I think that will be something to help her daily as well as myself! I would love to read your devotional book!!! Thank you for this on time post! I am having such a hard time with worrying these days. I’m in a dark valley and I know that God is with me, carrying me through this; but I still worry. I lift each obstacle and battle up in prayer, but I still worry about it. I trust God to provide for my family and I, but I still worry. I’m praying for more peace, for less worrying. Thank you for this analogy! Hi, Michelle: I pray you will experience that peace of God abundantly! We must (I am speaking to myself, too) cast our care on Him – not an easy thing to do, but doable because of Jesus and Holy Spirit. God continue to bless you richly! I can’t see that my comment went through so I apologize for doing this twice. I battle with fear and anxiety on a daily basis all my life. Your advice sounds good. I’ll try it. I’m also on anxiety meds that help a little. I was really looking forward to my devotional this morning as I was struggling with worries and frustrations over my workplace yesterday because of things that did not go as I was hoping it to be. Indeed God goes before us and this devotional was very timely. I am now reminded to not be held captive of my thoughts if they do not go with what God wants for me. Amen! Worry and anxiety is a part of my life and my 15 year old daughter’s life. Very difficult. Any help would be appreciated. Thank you. I am working on “be still” this year because anxiety is a HUGE part of my lie. We have three grandchildren and with each one we have had a crisis before they were two years old. I am a breast cancer survivor, and fear of the return or of cancer’s return can fill up my day. I hang on to God with everything I have — but reminding myself that He is holding me helps a lot more. Thanks for your words today! Hi, Becky. Thank you very much for sharing with us. I have often wondered if people are concerned (or how much) about the return of cancer. I am sorry you have a fear of it. Praise God you are a breast cancer survivor. 🙂 The reminder that God is holding us so very good! I am reminded of the verses about His strong right hand, and everlasting arms with which He lovingly holds us. Praise Him, and for Jesus Who made this possible for us! God continue to bless you richly! I was just expressing my frustration to my husband as I asked him ” How can I get over my worries and anxieties about money?” He didn’t have any immediate answers for me but you devotion did. I am really hoping to read this book to help me trust and give God control over our finances. I have evidence of how he has taken care of us in the past but I keep falling in to the worry trap. Thank you for the devotion to help get me on the right path. I know that worry…to an extent…effects my level of joy. Worry and joy can not exist together. Worry robs me of my day to day joy. Anxiety has been attacking me violently this past year. I’m looking for all the Godly help I can find. I am recently divorced (an unwanted divorce). I was terrified to think of being on my own, paying bills, keeping the house up, keeping my car running. Instead of crashing and burning, I dug deep into God’s Word, doing Bible studies…one right after another. Relying on His truth to get me through each day. I am now 6 months into this thing and blessing pour out daily because I have trusted God’s promises. I have had anxiety disorder all my life. I grew up in a very verbal and physically abusive home. I didn’t know that is what I had until my late 20’s. Then I was a single mom of two boys and each had some challenges on their own so anxiety just was constant. I am now trying to learn to actually deal with it because at times it drives me to depression. I wish I could just deal with a problem and be done with it. I wish the tape wouldn’t play over and over in my head at night when all I want to do is sleep. I throw that ball out to the field and there is a wall and it seems it bounces back. Now my oldest suffers through it also but he has already begun to learn coping techniques. Now his 50 year old mother needs to catch up. Your words and devotions always inspire me. God has helped me overcome fear a lot more in the past few years. When I begin feeling anxious, I try to begin praying and seeking His help. I often quote the verse, “When I am afraid, I will trust in You” to remind children in my care to give their concerns to God or I even sing a song that goes with that verse. Fear and worry is definitely a part of my everyday life at the moment. My husband is about to go to trial for a crime he did not commit. I know the situation is in God’s hands and with his strength is how me and my two young kids have gotten this far. The enemy keeps sneaking back into my thoughts with worrysome thoughts. My fear and worry is that my son will not remember that he is loved, and will try to take his life. I discuss this with Christ and I keep his promises that he will handle this and all my cares. Like Renee, I want to fix things for my sons. God’s word, reminding me of His faithfulness & sovereignty, has been the anchor. Isaiah 41:10 has been referenced in so many places- God’s whispers to me of His presence. Thanks for this devotional Renee. The fears of the unknown creep in from time to time, especially now with my Dad being sick. The unknown of whether or not his treatments are working (even though we were told his cancer can’t be cured); what will happen to my mom? Will she move in with my husband, daughter and I? What is in store for her? It’s scary, my Dad has always been my rock growing up. He would always tell me “don’t worry about something you don’t have control of”. I am trying to do that now and it’s so hard. I pray for strength every day, not just for me, but for my parents, my daughter and the rest of the family. Fear and anxiety were my mother’s constant companions as her dementia took control of her brain. I searched for scriptures to read to her and help comfort her. Funny thing was, they comforted me too. Thank you for the blessings of your words! Lately I’ve been turning to the Bible more than usually when I’m anxious/ scared. My son, also an Andrew, has always had great fears about things that keep his mind worried daily. Thank you for this great resource, and all of the wonderful devotions I’ve found in Proberbs 31! Something I struggle with daily. I love your illustration with the ball. I need to remind myself to do this every time a worry pops in my head instead of continually thinking about and worrying about it! More trusting less worry! Thanks for your devotion today! My husband says I worry about things that don’t matter. He is probably right. I try not to worry but it is hard. I really loved the idea of taken each worry and deciding what would Jesus say about this and visualizing getting rid of it. Thank you. I worry far more often than I care to admit and my first instinct isn’t always to let go and give it to Jesus. I love the feeling when I finally do let go and I want my heart to be more confident. I will use your “What would Jesus say to me?” Thanks for the devotional! When the gap widens between paychecks and bills. The ends just don’t meet. “Gnawin’ on a worry bone…” My friend’s description always makes me smile! I am guilty & I battle it day by day, hour by hour, moment by moment; I give it to god & then before I know it I’ve snatched it back! Thanks for your sweet voice of encouragement in my day! I feel alone and afraid at times my husband passed away and he always took care of everything so I worry am I doing the right thing. I pray for wisdom and understanding from God to guide me on this journey. Thank you for this devotional. It is such a blessing to me. I will be using it with my children. Thank you for this devotional. It is such a blessing to me. Thank you for sharing how to capture worries. I’ve heard to take thoughts captive but never what to do with them afterword. The last five years we have dug ourselves out of $50,000 of credit card debt on one salary. Praise God! I was called by God to stay at home with my children. I knew this calling at the age of ten years old. I got into the trap of wanting what I want and right now due to things in past that spilled over into our marriage. But God convicted me and I spoke to my husband about it and now we are living on a cash basis. But during those years it seems every major appliciance has broke or quit and a major health problem arose. But God supplied every last penny to pay for two new ac units in the house, refrigerator, pump float and new alarm box, car tires, car repairs(expensive), used washing machine(nicer than the 5 year old one), dishwasher, emergency surgery on our dog, another colonoscopy within months of each other. I have realized you cannot rely on money but on God alone. He will be their with you if you put your trust in him. Still not quite debt free but almost there. I am also an HSP(highly Sensitive Person) which causes anxiety issues bc I haven’t learned to balance things well as of yet. But with God all things are possible. This article brought tears to my eyes. I am working on automatic negative thoughts now. Pray for me to continue reaching for God in my time of need instead of material possessions. I have a few days a week where I have fear and I just rebuke it in Jesus name! I have learned through your ministry that using God’s word against the enemy is the most powerful tool we have to defeat our fears! I am a worrier but have always been able to manage it and like your said I never thought that maybe this would be passed on to my kids. My oldest daughter who is almost 6 has begun to be afraid and anxious about certain things that make no sense. She is scared to watch a DVD or go to a movie because “something may happen” at the end, although when you ask her what she can’t explain. She is scared to be left in the car when it is running. She is scared to be in the tub when the drain is pulled but is also scared to be in the shower if you cover the drain. She cannot be in either without a parent standing directly next to her. This is among other thongs. I hope this is just a phase, bUT I am also scared that it will just get worse instead and she will end up being scared of everything and afraid to leave the house. I suffered from panic disorder/depression/phobia for more than 15 years. The lord healed me completely one day at a prayer meeting. How much does fear or worry impact your daily decisions and joy (or your child’s)? Every day. My fear of failure paralyzes me to the point that I become inactive. I don’t want to share this with my boys. Fear controls so much of my life. I’m always worried about what others think. Fear is controlling me to the point I became unable to function at work and am on long term disability insurance for anxiety and depression – I don’t want to end up on government disability but am overwhelmed with anxiety! Although I am still a work in progress, fear still grabs ahold of me so easily. I fear the judgement or criticism of others because I fear letting them down. “Am I screwing up my kids? Does my husband still love me? How are we going to pay for the van that broke down? I’m not doing this motherhood thing right! Why can’t I find friends that stick by the way I stick by them?” I’m learning what my strengths are and how best to do the things I should and shouldn’t, but saying “No” has always been difficult. Fear likes to hit me most when I am trying to concentrate or sleep. It causes me to second guess everything I did – good and bad. Sometimes my fears are because I won’t let go of past hurts or disappointments in myself. Giving it to God is what I work on. Sometimes it’s easy and I can trust that God is in control and others I must ask for God’s help with every breath. God has a good plan for me (Jeremiah 29:11), God won’t abandon me (Philippians 1:6), God’s been with me since the beginning and won’t leave now (Psalm 139), and God loves me no matter what (1 John 3:1). These are the truths I hide in my heart so I can make it day to day. That doesn’t mean it’s easy. There are days I don’t want to get out of bed, but I know that God will be with me and help me through the difficult times. God’s brought me this far, He won’t leave me now. When my children worry about a decision they need to make in regards to which direction/choice they should make, my husband and I also say, “You cannot lose what you do not have” so after praying about it, make a choice and go for it! God will direct our paths when we are abiding in Him! I am such a worrier. I am trying to overcome this. Your devotion comes at the perfect time. Thank you so much. I’m worried about being separated from someone I love. I’m afraid of the future. I worry a lot. I wonder what I’m worth. What should I do with my life? Can I really make a difference in the world? Sometimes I feel alone in the world. It seems everybody’s against me. I can’t do anything right. I’m afraid of what could happen. The possibility of death frightens me. I need to make a decision, what steps should I take? →Pain of regret. When fears and worries come I stop and begin running the opposite direction. Eventually, I gave up and life at that time seemed pointless. My thoughts grew more and more negative and soon the words I say and the things I did became more selfish. I didn’t have a sense of direction and I didn’t know what I wanted anymore. Fell into depression and three times I’ve attempted suicide. →I now understand that I was never alone because the Lord our God is Faithful and True. All that I went through was exactly what I needed to break me down humbled before God. Once I made the decision to intentionally live for the Glory of God and in everything to please him who enlisted me and the rest is history. I struggle with fear and anxiety everyday. But I know God is more than capable to transform those fears into faith. But it takes work on my part to take each thought and do like you said, ask myself, is this something that Jesus would say? When it’s not, throw it away and keep doing that until I allow Jesus to truly have control over me. This book sounds great. Am I good enough, can I be better ? How will my coworkers judge me? Fear of failing stops me from trying. I really needed to read that today. I am behind on emails, but God put that there for me to read today. Thanks so much for all that you do. I have fear and anxiety everyday. I know the answer is Jesus! But I forget and fall beneath the waves, instead of keeping my focus. As a child, I almost never worried. I was bullied in school but I don’t remember ever actually worrying about it or feeling anxious to go to school. My mother worried all the time, and still does, about everything. I remember telling her that God would take care of everything. Now, I worry more, having become a mom myself and as I watch my son struggle with a whole gamut of issues, including his biological father leaving when he was 2 and the sudden death of an infant sister, ADHD, and behavior problems at school. I worry about him constantly. I always trusted God as a kid, but have felt ill-equipped to teach my son how to do that in his circumstances. I had a much simpler and safer childhood than he has so far. This article has given me a perfect way of talking to him about all of his many fears. Even the ones he doesn’t really understand as fears yet. It was a much needed reminder for me to just trust again and a doorway to help my son open up too. Thanks so much! Worry and fear do hinder my decision making – especially those big decisions. I am constantly asking myself, “Am I doing this parenting thing right”, ” Should I discipline this way”, “What should I do about my husband’s work stress”, ” How can I best help in”, etc. This book would be great to help me focus on God and what I can’t control! Fear can be so debilitating and such a robber of joy!